Looking for the best Halloween yard decorations? Our guide takes a look at some of the fun, creative ideas available. From ghosts to inflatables to flamingos (of all things!) we’ve collected all the information for you to buy the highest quality product with the least effort. The fact that these even exist is hilarious and amazing. They look really cool! The instant I saw these, I knew I had to dedicate part of this article to them. Some reviewers said they kept the flamingos out year round, they liked them that much. Some customers felt the price was a little too high, and some said they wished these glowed in the dark—but even without that effect they were pleased. Overall, though, customers really liked these Halloween yard decorations. I really like that this decoration changes colors. It’s advertised as turning red, green, or blue, but from what I can see from one customer’s pictures, there appear to be several more colors than that. This company makes another similar decoration, but it’s meant to be a pumpkin kid and has an orange drape instead of a white one and doesn’t change color. I like this ghost kid better than the pumpkin kid. One reviewer noted that this ghost kid isn’t weatherproof—so place it on your porch or just inside your house. Additionally, they said it stands best if the legs are reinforced to the base of the decoration. Overall, customers found this to be a cute, not-too-scary addition to their Halloween décor. This Halloween yard decoration is adorable. I’m a huge fan of word play, so this inflatable stood out to me based on that. It seems to be fairly durable, as well, which is good. Some reviewers felt the price was a little high, but still liked the product. Overall, this inflatable would be great for any dog lover—either for yourself or as a gift! This inflatable looks to be really good quality. I especially like that the fan is included; that really speeds up the process of putting this up. I found it interesting that this piece uses incandescent lighting instead of LED lighting as I feel like the latter is more common. Some customers felt the price was a little high, but when you take into account the quality of the yard decoration and everything that’s included, it’s not too bad. 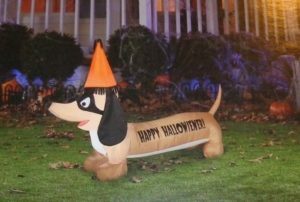 Overall, this inflatable would look great in the yard on Halloween and is sure to draw admirers. All four of these Halloween yard decorations are really cute. You can select which design you want under “Colors,” which is great if you’re not a scarecrow fan. My personal favorite is the witch, but the quality of the work on all four statues is stupendous. One reviewer said they wished these were a little taller, but they still enjoyed the statues. Overall, customers found these to be great Halloween decorations for displaying carved pumpkins. This Halloween yard decoration is pretty cute! My first thought upon looking at this was that it reminded me of the Wicked Witch of the West from The Wizard of Oz. I have a few friends that enjoy that kind of thing, and this flag would be perfect for them. It’s important to note, however, that this flag does not come with a flag stand or flagpole. It does have a sleeve at the top of the design that is made to fit any standard-sized stand or pole.